Although the Post content type is separate from the Page content type, the process of adding, editing, and deleting them is nearly identical. So in general, when editing posts you can use the instructions for editing pages. By default, Posts do not have the Page Attributes box, though some themes add this box for Posts. By default, Pages do have categories and tags as discussed below, though some themes add this box for Pages. 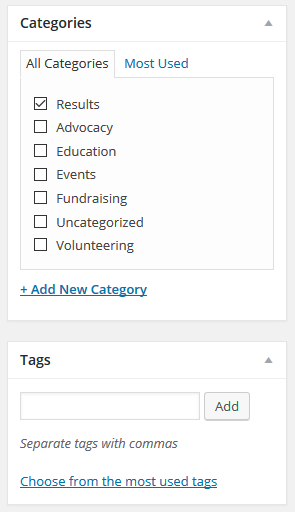 Categories and tags are settings to classify your posts. These are often referred to as “metadata”. In other words, categories and tags are data about the data. They tell us something about the post or page. Some WordPress themes make use of categories and tags; others don’t.